Lost On The Road To Eternity contains eleven new songs, among them the first single release "Without Love" and a duet by Catley and Tobias Sammet on the title track, a kind of artistic thank you by the EDGUY/AVANTASIA frontman in appreciation of Catley's guest stint on a number of Sammet's releases. 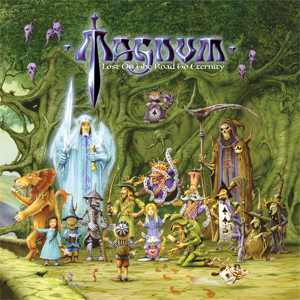 The release will once again be complemented by Rodney Matthews' atmospheric cover artwork as well asa total of four live bonus tracks on the CD digipak version ("Sacred Blood - Divine Lies", "Crazy Old Mothers", "Your Dreams Won't Die" & "Twelve Men Wise And Just")recorded at MAGNUM's 2017 performance at the Leyendas Del Rock festival in Alicante, Spain. Lost On The Road To Eternity has been scheduled for release by Steamhammer/SPV on January 19, 2018 as digipak version incl. bonus live disc, 2LP coloured version, download and stream. "Welcome To The Cosmic Cabaret"
"Tell Me What You've Got To Say"
"Sacred Blood - Divine Lies"
"Twelve Men Wise And Just"